Google is turning up the heat when it comes to making the Nexus 7 tug on your heartstrings. Earlier today it released the first commercial for the slate that featured a father and son camping behind their house. Now it has also begun to spread a video made by one of its own. 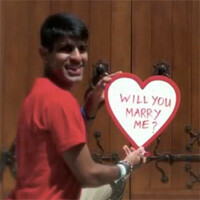 Google employee Raj decided to pop the big question to his girlfriend Aditi earlier this month. Opting to go a very creative route, Raj gifted his love with a brand new Nexus 7 and a couple jellybeans while in Chicago. In the end, Aditi said yes and Raj uploaded a video containing the backstory, the video he made for her, and a photo of her response. That's not saying a lot. She likes Justin Beiber. I paused it when I saw JB, I just couldn't watch it anymore.